YouTrack provides a predefined set of issue fields that can be used out of the box, but they are all 100% customizable. Define your own States, Priority, and Types; add an Estimation, Remaining effort, or Spent time. Use fields types like Enumeration, Date, String, Int, User, Group, Version, State, Build and Subsystem to reflect everything your issues are about. 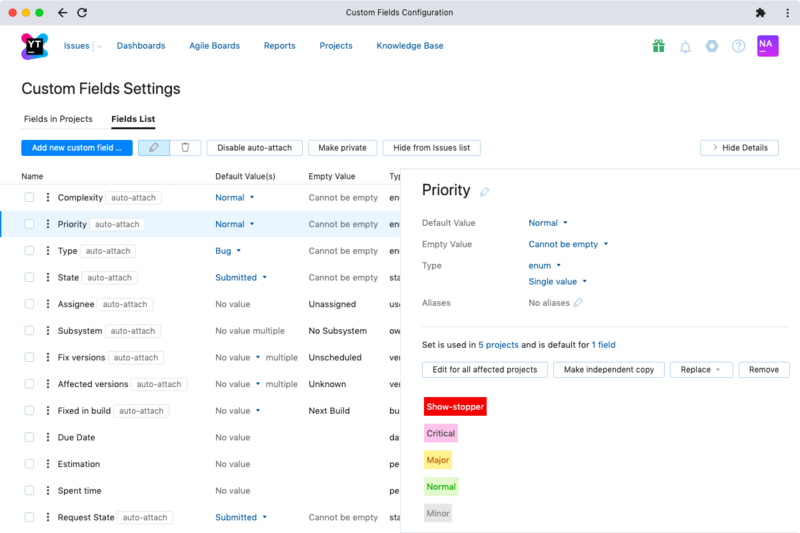 Project administrators can add values to custom fields from anywhere - on the agile board and backlog, from the issues list, and in full page view. You can set the name, description, and assign a color to the new value. This feature saves you a lot of time configuring your projects. Share custom fields across multiple projects along with their set of values, or define your own set of values specifically for each project. For example, you may share State and Priority, and have your own Verified by or Current Owner field. Any custom fields you create are fully supported in search queries, commands and reports. They can be imported from any issue tracker, exported to a CSV file, and managed via REST API. Configure defaults for a new issue. Add aliases to be used in search queries and commands. For example, for is the alias for Assignee field. Set a custom field as required on project level. Clone the Enumeration set of values. Change the order of issue fields on project level. 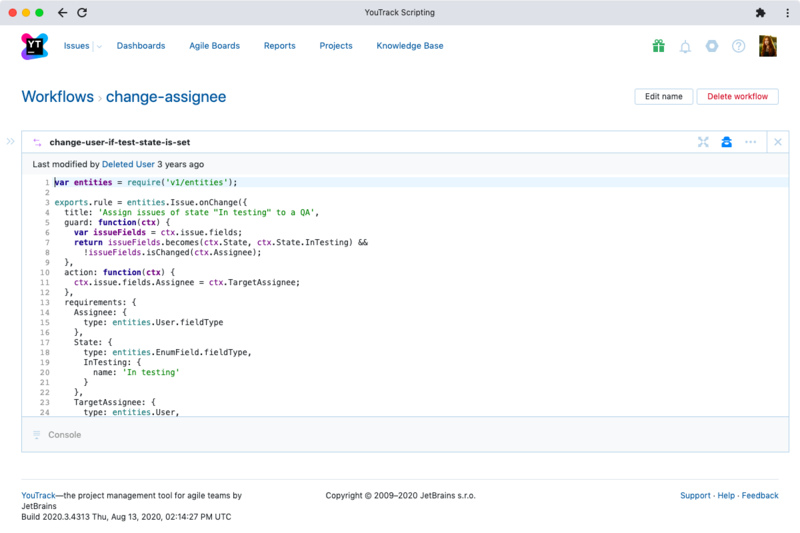 With powerful and flexible workflows you are free to automate the lifecycle of issues in your project according to your specific needs. With workflows, you can easily notify teams about events, enforce policies, execute periodic tasks, integrate YouTrack with external tools, and support existing business processes. The team lead to be able to assign issues in your project. Send a notification to the team lead/group of users when an issue exceeds its due date. Describe the mechanism of state's transition for the issues in your project. Setup integration with Slack, or another service. All of these, and much more can be performed using the workflows. 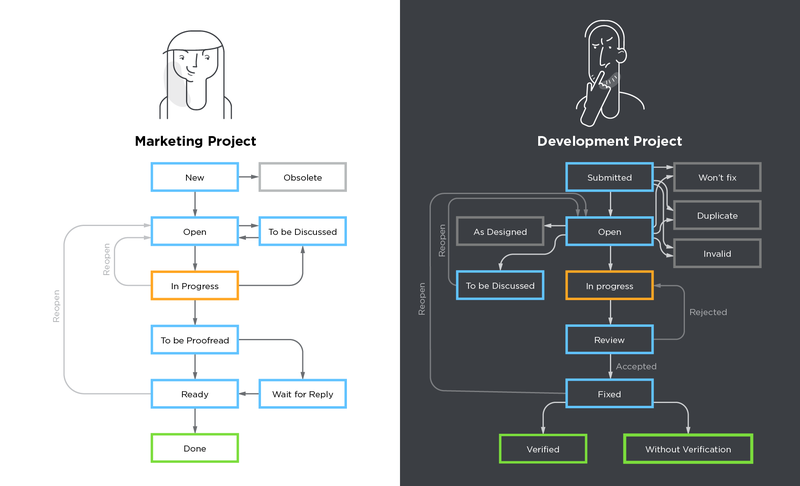 A workflow is a set of rules that can be attached to a project. These rules define a lifecycle for issues in a project and automate changes that can be applied to issues. A workflow can contain one or several rules, but you can choose which combination of rules you want to activate in different projects. Check the documentation to get started faster. Join YouTrack Workflow Community in Slack to exchange knowledge about workflows in YouTrack. 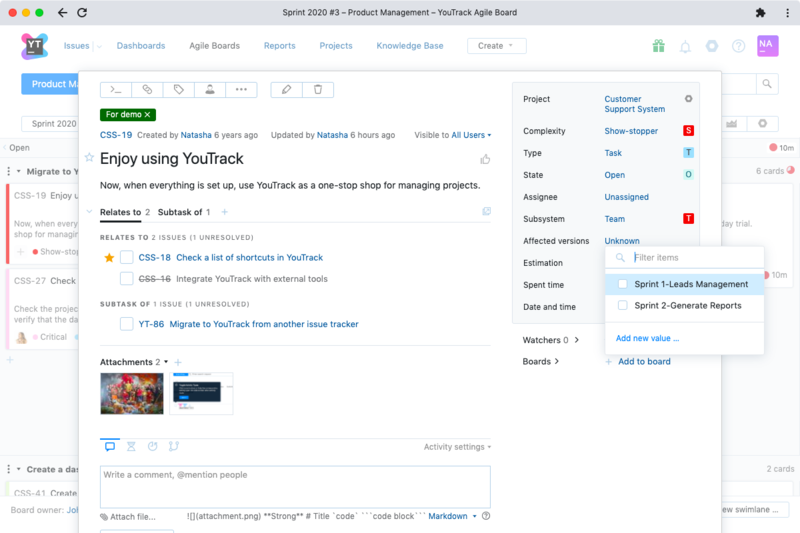 YouTrack comes with a set of ready-to-use workflows that can be easily attached to your projects ‘as is’ and handle common use cases. 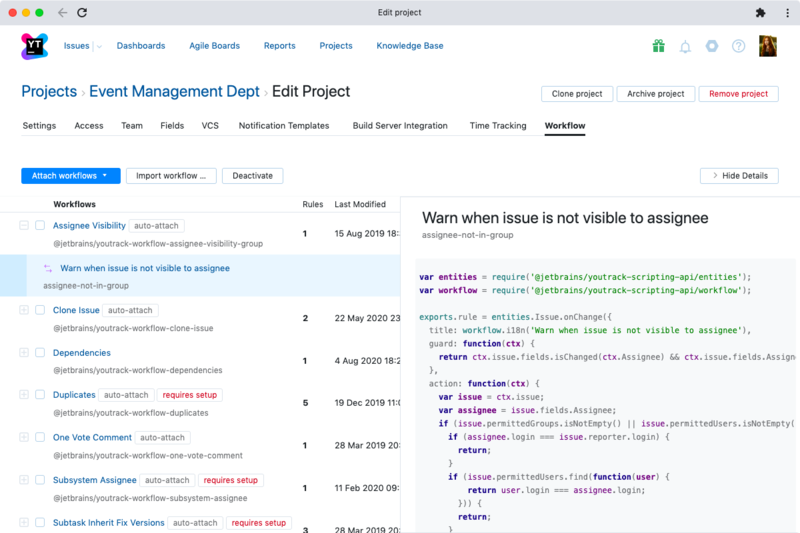 For example, close the parent issue when all its subtasks are resolved; raise issue priority after a certain time period; manage duplicates; implement a work timer; and much more. If you don’t find the workflow you need among the bundled ones, browse our Workflow Repository. YouTrack is available in English, French, German, Russian, Japanese, and Spanish. You can even create your own translations for any other languages you need. 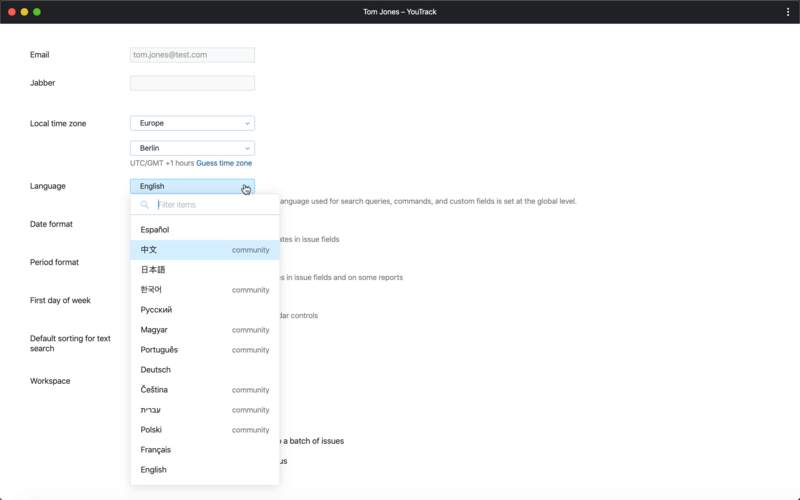 YouTrack provides localization on a server level, so you can easily roll out your language to all your users. YouTrack also has the option to choose the display language on a per-user basis in the user profile page. In this case, the language that is used in search queries, commands, and custom fields is set at the global level, but the page headers, menus, and controls are displayed in the user’s preferred language. Customize email and jabber notifications to suit your user communication requirements. Choose how to alert your users when a new issue is created, updated, commented or reassigned. Add your own subject, change the language, tailor the message text, and more. Want to practice an individual approach to your users from various projects? 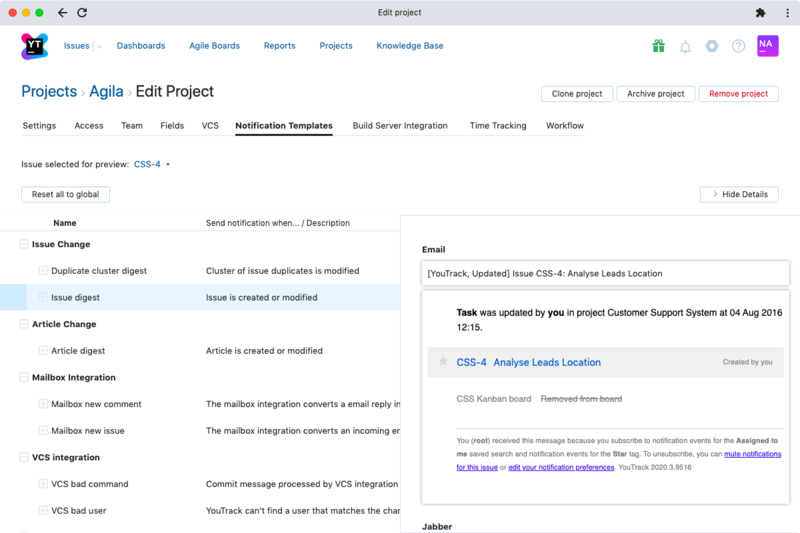 Configure custom notifications templates on the project level. Set up multi-language notifications or completely redesign them for each project. With the Issue Digest notification scheme, you receive a single combined notification when an issue is created or updated so your email doesn’t get cluttered. If you prefer to be notified of each issue change as it happens, the Individual notifications scheme is available as well.